Samsung Corby is really a cool series from Samsung mobile phone and some of the models are having some unknown and never said secrets which are really surprising and a lot interesting. I want to share some secrets with you today. First we will go with basic codes and after that we will get into real action. *#06# — This will show the IMEI(International Mobile Equipment Identity) number of the mobile phone. #*7728# — This is a master reset code which will not delete any thing from your mobile but will set everything to factory default settings when it was on the time when we bought at the time of purchase. Now i will write some codes which might not work in all mobile phones but they are really working in some other mobile models of samsung. *#9998*4357# — This will bring a Help Menu where we can select a lot of inbuilt options. *#9998*5282# — This will bring a Java Menu where we can set the GPRS/CSD Settings for java server. *#9999#0# — This will bring a Monitor Mode Menu. *#9999# or *#9998*9999# — This will bring a Software Version Menu. *#8888# or *#9998*8888# — This will bring a Hardware Version Menu. *#9998*746# or *#9998*0746# or *#0746# — This will give the Sim Information. *#9998*523# or *#9998*0523# or *#0523# — This will display the Contrast options. *#9998*842# or *#9998*0842# or *#0842# — This will bring the Vibration On options. *#9998*289# or *#9998*0289# or *#0289# — This will bring the Buzzer On option. *#9998*288# or *#9998*0288# or *#0288# — This will bring the Battery & Field Information. *#9998*782# — This will bring the date and alarm clock options. *#8999*638# — This will bring the network information. *#9998*968# — This will bring the melody for alarm option. *#9998*585# — This will bring the Non-Volatile Memory (NVM) option. *#3243948# — This will bring the Digital Audio Interference Off option. *#32436837# — This will bring the Digital Audio Interference On option. I will post some more awesome codes which are really cool to read in my next post. These tricks are tested and they are working fine.i have also tested in my samsung corby txt b3210 🙂 they work fine and some which are not working with other models of corby can try other codes which i will post in my next article. Well,first dial *#52828378#…when the java test menu appears,go to OTA test…then u’ll find the “Maximum JAR size” option…u can increase the default value there. Hi everyone, i try this memory extend code for my samsung GT-b3313 but it won’t work plz tell me memory extend code..
Akshay, i didn't understand at all. what you want to extend???? hey fo java outta memory error dial *#5239870*# it Wil pop up a menu..select internals..it’ll ask a master key…its *#7092463*# go to storage settings n update ua java db…den exit d menu…problem solved!! will u plz tell me how to come out from memory mode to phone mode..
as if i connect my mobile to pc it dosen’t show my device name……. but how it is possible..? as there are no option like that in txt. I am very new to this and am a little confused. Where do I put in the code? When on the widget screen, I have pressed keypad and then typed the code in and then used call but that doesn't work. Sorry for the trouble. so you do just key it in then dial? ok; thanks for your help. Hey hi satish. i am sorry to say but not a single code is working on samsung s3653. Not even the first 4 accept imei no. Can we have an application to open .pdf, .doc attachments in corby txt. yea that's easy option na ?? go to menu–>applications–>in that select the 6th option which is blue-tooth. again in that go to options and select 4. which is Activation on/off click on that. Is there any application to open word, pdf files. Also does auto mail polling work for all servers & with resettable mail retrieving time. Hi could you get a code for maximum file size? its now 500kb limited and on sites it says it can be unlocked to approx 2mb. my phone either tels big size file or invalid java format or java error. Hi anonymous 🙂 as per samsung corby we cant install a java file which exceeds a size of 500kb so we have to crack it with a code which i am finding and will post soon regarding that. and if u want to install any dictionary in ur phone, it has to be a java file or a jad file and make sure u install in your phone from memory card. i am waiting for your code. yes i have both jar & jad files got using jad maker. That code does't work on all models. it works on my e250 but not on my txt.. They modify the OS a bit for each model.. So there's no guarantee that all the codes will work on all the models. can u tell me where i can find full version games compatible with corby pro…. hi, u can try in http://www.getjar.com where u can find free full java games. Well a post regarding installation of java apps on older samsungs can be put up.. I had quite a hard time getting through with my e250. Finally managed to learn how to install.. And some PC Virus removal related posts can be put up.. I dunno anything other than samsung in Mobile phones.. N some PC troubleshooting tips can do i guess.. I didn't know how to write a guest post.. So putting it here.. Please don't mind. @nahanonye: You cannot undo the java midlet deletion. And the maximum jar file size which you can install is 500KB. Above that it gives the error. Hello. I live in Singapore. A friend from Brazil just gifted me an unlocked Samsung Corby GT-S3650, and it works fine with my SingTel SIM card. My problem is that the installed OS is from a Brazillian phone company, thus it's in Porugese and has many installed applications for which I have no use. I've changed the language to English (although some things are still in Portugese) but when I try to uninstall any of the phone company software I receive an error message from the Samsung New PC Studio that "This Device Is Not Supported." Please, is there any way to uninstall this phone company software and install a generic version of the OS? Thank you in advance for any help; I appreciate it. M. Satish Kumar: Thanks for your reply. I've tried resetting to factory settings but I still can't do anything with the phone company OS (maybe I should learn Portugese :-). I've spent 2 days Googling with no luck and am about ready to learn to live with all the TIM (the Brazillian phone company) applications (and their logos), but I'll still check back here in the hope that you found a solution. Thanks again for your kind help. yea sure i will find a way to solve your problem. keep visiting here and leave ur email id so that i can message you when i have resolved your problem. @anonymous hi dude your game might have some error in itself, if not then use this code *2767* 5282# and this will reset your phone. note that it will delete all the phone java applications and again u have to install them. note that playing more games in samsung will screw your mobile. so as per my suggestion install 2 to 3 games which you want to play. @Danapache dude no matter i can help in this because the email comes under message and that has to be taken care of your service provider which you are using. i am sure that you have to contact your customer care and solve the problem. i will tell u soon how to configure as i am using vodafone here. Hi i got both of your email with a game in that and i will resolve the problem asap and let u know soon. A@nonymous thanks and which phone u would like me to write abt ???? @ankit hi, as per my knowledge it happens only when there is more load on the phone. may be u have to master reset the phone once. and if have done that then reset the java settings and also make sure ur battery is good and also there are chances of not enough memory so better clean up ur phone memory and if possible format ur mmc card and phone once and then try. restarting of the phone in middle is not a good sign 🙁 so better do which is said here and plz come back if this didnt work for u 🙂 i will find another way to solve it. did u tried to replace the battery ? if not do so, and this happens only when u use a GPRS or with any work u do with ur phone. yea i got ur email dude. but i couldn't use it since i had a max jar error. so i didn't get any updated news on that. just wait for some more days. will find out soon. @Ankith they have to replace the battery if it has the problem. Your phone has a serious problem which cant be resolved by a code or a key. so you have to take it seriously to a service center and ask them to check the MBoard once again and replace the battery. u have buyed the phone so u have full rights to ask them. @anonymous can u tell me what that error is exactly???? @anonymous yea sure i will let u know if i have found the solution. These tips are really great working. Thanks for sharing with me! hi, some of the tricks also work your phone model. and also check our forum where we posted some more codes and tips and i am sorry there is still no way to get the themes for corby. How it is locked? Is its a passcode which asks at the startup? Is the display on ? i mean is the display working ? what is the correct error its showing??? May be you have done something to lock the phone down. please mention the correct error. If that is switched off and not getting on..then check your battery. If every thing works and then still not working fine..try to reset the phone..with both master reset and some reset codes given above. May be you have burned ur board in there or bricked the phone. If the battery is replaced with a new one and still no result. Then its better to go to a service center to register a sudden power off complaint. Please dont tell them that u have entered some code and its gona dead. they wont give warrenty for phones which are bricked. Its not because of virus. Its because of some internal hardware problem i guess. did you found the code for java files greater than 500 kb ?? How can i increase volume in samsung corby gt b 3313? Thats sounds good 🙂 hope your phone will be replaced soon reggie. Its mostly the battery or a component problem, not the software. These codes will not work on all samsung corby phones sandip. i am trying to find new codes for samsung corby pro and also other models. as soon i find them i will write them in a new post. subscribe my feeds above so that u can get a mail. I accidentally deleted my widgets including the “MORE widgets icon”. Now i cannot download widgets for my samsung corby wifi phone. Is there any way to retrieve it? or resetting the phone may solve it? how can i get it again, the more widgets icon? Sir, how can i delete inbult apps from games and more of samsung c5010? and how to increase its vol.? Hi abhi check this http://www.coolpctips.com/2010/12/how-to-improve-samsung-corby-music-and-volume/ for increasing samsung corby volume. to delete in built apps just enter this code *2767* 5282# and dial. how can i install application more than 500 kb in my samsung corby mate?? ?pls answ…………every time it says that “out of memory”………….i can’t install games more than 500 kb……….pls help………………………………………..
You can try this http://www.coolpctips.com/2010/11/how-to-bypass-the-max-jar-files-in-samsung-mobiles/ and also check above replies which i gave. the java code is not out yet. if its the case i will mail u for sure. dont worry. earphones.please help me is it my speakers or software. Hi satish……..u did n’t ans. my qustion.i found that corby mate have 10-12mb space for apps. but for every apps. its default is 500kb.please find the code which can enter into default java memory…..
Hi satish……….. Did you find the code? hey Sudip, as i told u before, the code works on few phones. but unluckily it is not supporting in your mobile. i will post it as soon as i can. the samsung team is not publishing them. i am using a corby plus… i want to know if themes can be changed some how ! … and the music player to options such as artist album etc… pls help.. In Corby u have to stick to the default themes. If you are lucky enough you can try the android theme which is out for samsung pro. just give it a try in youtube. type as samsung corby android skin working. and coming to music player in samsung, u cant change the options. but u can try installing some java apps which are available for free in all over internet. Hi Hi.. U r an expert… Saw ur post right now. Pls send me the code for makeing java applications accept more than 500KB in corby mate. Pls.. U can mail me to chitra.archana@gmail.com. THank you. Also let me know if B2100 marine phone can accept .jar games. it works along with .jar and .jad files only. pls help..
Corby txt b3210 is not supporting Opera mini browser. Even i have the same problem. will sort it out soon and post a article. i have forgotten the phone lock code, which i entered. NOW THE PHONE IS LOCKED AND WHEN I POWER IT ON ITS ASKING FOR PHONE LOCK CODE, WHICH I HAVE FORGOTTEN. PLS FIND SOLUTION FOR THIS AS I CANNOT USE THE PHONE AT ALL, AND THERE RE VERY IMPORTANT NUMBERS IN THE PHONE BOOK, WHICH WILL BE LOST IF I FLASH THE PHONE. can i please know the phone model name ? can i get new version software?? can i change the music player option?? with rs:250/- you can upgrade everything in any nearby samsung service center. its safe and secure to keep your phone in experts hands. they r great i had one before..
HI , I am having problems with my Corby 2 [GTS3850], i cant install apps and games into my memory card [4GB], instead it installs into my remaining 30mb- of phone memory, need some codes or a video of it will be really helpfull, Facebook, Avinaash ganapathy k! try to master reset it.. and try not to install any keys which you are not aware of. i have a samsung corby pop GT 3510..
i use tata docomo and net doesn’t work on any java application. it works only on the default browser. you can try using the uc browser or the opera 11 in your phone. no dude, as far as i know, when you reset your phone, everything in your memory card will disappear, that is the reason you are unable to personalize your ringtones. if you want to check it again, install some songs in it and then try for personalizing your ringtone. and there will no issues with any functions, its just that they have been reseted to their original places. find them again and re arrange. hey gys i m new user in samsung gt-s3653.And first time open this page so can u plzzz give me any new code or any tricks . I am having Corby Pro, I tried to install few games then it says java errror, no memomery available. I tried few options given at few web pages but no luck, then i master rest my mobile. Now i am unable to install any downloaded games as it says unsupported file type. I downloaded the games once again and used them in a seperate folder but still same problem. My samsung corby 2 sound speaker won’t work out loud?! But when i switch or put my headsets the sound works.. why?? please help ! i have one doubt ! does Samsung chat 322 has the features like mobile tracker, auto call reject, fake call, and all security locks ? if anything , just mail me to : rabinaya11@gmail.com as soon as possible ! or else tell me that , which mobile has the features which i have mentioned above ? I have a Samsung 83410 R or B3410 R ( I can’t see the model # very well). The phone still works to make and receive calls, and the qwerty key pad works, but the touch screen doesn’t, so I can’t read texts or send them etc. Have I accidentally locked it somehow? How do I unlock it? can we add new themes to samsung corby txt b3210..
and if yes plz tell me the ext. like for other phones it is .nth,,what is the ext for samsung corby txt.b3210. I have deleted all my messages from my samsung phone (B3313) by mistake.. Is there any way I can recover the messages back?.. i have a samsung GT-B3313.I CANT DOWNLOAD MP3 SONGS more than 4 mb.is there any solution? Hi i tried all the codes but it displays only this no. : 404641100899782 for all the codes. what should i do? I m using Samsung Corby SCH F33 handset n it is not detected by Samsung studio software..
also my java apps is not getting loaded..
hey these shortcuts r cool..its easy when u get the help menu..u get the codes remaining codes frm there itself..thnx buddy! btw can u tell me what kind of games s/w and text reading s/w like .pdf in windows does samsung b3210 support? hello sir , i m using samsung b3210 corby txt & this phone can not instal applications above 500 kb. please help me i m frustated..
Hai.. I am using samsung gt s3850 while using any application onscrean direction keys occupying half of the screen. sir i have samsung gt c5010 mobile phone.. and i have enter code #*7337# to reset my phiand then my imei no. becomes 0000000000……. nd doesn’t showing any network for any sim.. pls help me to get them back as early as possible.. please email me to provide proper knowledge and help..
dear Satish, I forgot the sms code of my former samsung Corby. How to unlock it without loosing the old sms or the repertory ? thanks for your help. My samsung corby gt b3210 does not allow internet access with other networks aside mtn,i need help on that…thanks, theo. could you please tell me that, how can i move messages from phone memory to memory card in samsung corby txt GT 3210 ??? My mobile is switching off again and again while using web. Please reply here if possible. pl suggest. and also pl let me know which is best browser for my handset. how do i use these codes? i’ve tried typing #*7728# — This is a master reset code which will not delete any thing from your mobile but will set everything to factory default settings when it was on the time when we bought at the time of purchase. i have accidentally deleted all of my messages in my samsung corby 2 phone. is there a code that can recover it… thanks..
Hey satish can u show every working code for Corby s3653 model until nw and can’t i revert the installing of dos java apps in my memory card instead of phone memory. n x why wouldn’t d jad files which are saved in the memory card won’t install. if anything latest comes up about Corby 3653 version do Snd it to my email:sonaji.abi@gmail.com. n WHT does flashing do exactly? can it add up any new features lyk voice mail? Appreciate it a lot. n is der any way i can update my mobile i.e. mine is a samsung proprietary touchwiz 1.0 version n d latest is 4.0. so anyway to update it. m using corby 2. and i am unable to download pdf files. while downloading it alwayz show no response..
plz tell me what to do.. i wil be very grateful..
i like to knw how to stop saving conversation list and also sent items while msm..
Hi is there a way i can undo *2767*3855# my text messages memory has been deleted . i just bought samsung corby II but i face some problems where i cant change my ringtone…it said ‘phone memory full’ i dont know how to clear the phone memory…i also cant play the mp4 video in the video player..
all this hapening to u is bcz of ur phone’s full memry. better delete some items. go to settings nd then to memory,their is an option to clear phone memry.. clik on it nd mark what u wana delete. your pblm wil be solved. plz temme abt pdf files.. I have downloaded some files, 3 months back and found no problem. but now whenever I tried to it always shows on response . m using corby gt s3850. ALL THOSE USING SAMSUNG B3210 download this operamini it installs and is very fast. if you install it exit the app. when you go to activate the app press option and change connection to the your network provider and save then try the app. can it be extended ? Hi Satish i forgot my password of corby s3653. is there any code which can reset it as it was before when i bought it??? It worked i read your comments and tried a code but now all my contacts, memo, tasks, caller i.d and everythingz erased can i somehow restore them?? Hello! I badly need help with regards to my samsung corby 2 phone. I dont know what i had pressed that suddenly i am writting letters to be able to send an sms message instead of clicking the letters in my whole keypad. Please badly need your help. HELLO MR.SATISH, My corby plus b3410 keeps switching on and of, how do i update its os??? plz give me a solution!! is it possible to transfer messages in phone memory to memory card or my computer through pc studio??? good day! i am having problems with my samsung corby 2.it keeps on rebooting. i can’t even reach the menu of my phone.i think i might need to reformat it.any ideas and suggestions? thanks! Hi. Bro I have Corby I will ask you how to deactivated browsing . Hi, i have a samsung gt-b3210 and i cant download anything because an error comes up to say not enough memory but there is loads of memory space and they are app’s i have had on my phone before. I pluged my phone into my pc and it came up with a few bad viruses and deleted them, i dont know if that has anything to do with my problem? Please help. I used to like my Corby pro. But now, I hate it because I cant install a thing and all my files are lost (especially when moved from memory card to phone, they disappear). Another thing, can I change my OS? Is android possible? if not, then windows 7 possible? I have a samsung corby pro. i was having airtel sim nd the mob worked very fine.. now i changed my no. to bsnl.. now every time i try to send a message, it says “unable to send message while sending”. after that, if i switch off the mobile and on, three messages wil go without any prob.. again from fourth msg, it will say “unable to send message while sending”. i checked the sim with other mobils for text message centre no.. it s same as shown in samsung corby pro. in other mobiles i’m able to send innumerable msgs witout any issue.. so it s surely the prob wid mob… in my mobile, mobile tracker is on.. i couldnt reset it.. it is aking for password.. but i ve not set any so far.. i tried *2767*3855#.. But, again it asks for a 4-8 digit password..
now i tried *2767*2878#.. it displays “Press Back Key or # key TMCommand:732”. Keypad is also displayed below for entering the nos.. i dont know wat i shud do now.. im n desperate need of your help to reset my phone..
dude, you have to switch of the mobile tracker when you change to any new sim. Try doing that. you should reset it with a default code of 1234 or 0000, if not try to master reset the phone which will work for sure. Clear your phone memory and make sure the saves are set to phone if your mmc is full. Hi satish……….. plz., tell me how to increase my samsung GT-S3850 Corby 2 mp3 volume? Help me….. I have no idea how to eneter these codes you speak of. Where do I enter them, please know that I am not connected to the web either, but I am having a difficult time (didn’t before) to upload pictures and music into my pc. I have samsung Coby pro gt-b5310 i want to use android on my mobile if u have any solution pls reply me. Its not possible mate 🙂 you can just install a android theme. Find it in youtube. Can you be more specific about the restart ? I mean when does it restart and why does it ? if it restarts only when you use your browser, then change it. you can use browsers like UC browser, Opera for java phones like samsung. You can actually try them once. If it still restarting then master reset your phone and then check browsing. If you still have a problem, then let us know. Hi,I would like to install new font to my samsung corby2,but the size of font too big and my phone internal memory not full enough to install it. Is it anyways to increase the internal memory of my corby 2? find anyways to install GO SMS on samsung corby 2? Hai there,,, i hope you teach me .. how to set the memory card as the default for my Samsung GT-S3850..
why does my samsung corby 2 shut down by itself? is it time to change a new phone because its spoilt? Sir, m using gts3653 , its having very less message memory ..for 200 msg it shows memory ful…plz help me to increase msg memory..!! I had formatted my samsung corby pro mobile & all the contacts got deleted… Is ther any way to get back the contact list??????? Hi, tanx for useful info. I have problem with password. i put password on my memo part and now i cannot remember . is there any way to delete password without deleting data on my phone ? my mobile model is samsung GT-B5310. hey dear, pls help me. Nowadays i am getting very crazy about conversation view for msgs. Thats really ausumn. Does samsung corby s3653 has that facility? If yes tell me how. I can do anything for that. I would be very happy if u cud find this out. hi, plz my samsung gt-b3210 is not displaying and is showing me something like error ( ! ) if i dial num is going but my msg is blank, so i cannot read it and i cannot see my contact neither my dail nuum. Plz help me with this. how to unlock my phone plz tell..
how to remove password from my phone..? Samsung mobile users must bookmark this post. Great share dude. The Above Codes are not working in My mobile Even after restarting My Mobile Model Is Samsung GT-S3653 What to Do? hey.. can any 1 plzzzzzzzzzzzzzzzzzzzzzzzz tell me how to rest my password without deleting anything else on my phone,,, shall i try the code hash star 7728 hash ? i have the same phone as you,but some of these codes dont work. *#9998*1111# — This will bring a Software Version Menu. *#9998*2222# — This will bring a Hardware Version Menu. also do you have any idea how to change java settings? by default the phone doesn’t run any application larger than 500 kb,but ive heard it is possible to modify the settings and run apps of upto 2 mb.please mail me if you do find out. i am using corby 2 gt s3850 and i want to reset my phone , but while trying to reset it asks for password ,which i have forgot ….. can any one help me…..
try this men it will upgrade ur phone menory.. here ? *#1010# ..
Hi frdz u can know the samsung corby pro B5310 hardware and software. Type *#2222# it display Hardware version. Type *#1111# it displays software version. Samsung corby pro buttons not working u can type the hardware version number and change the hardware version number ur phone functions all working normally this code working in my samsung corby pro b5310 phone try this frdz…….. I have a Samsung Gt-B3313 and it cannot play apps with a jar size greater than 500Kb. I tried many many codes. (The *#52828378# etc etc), none work. Please help. ya, same problem for me too. did u got any solution? 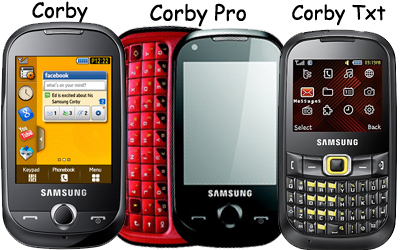 I have a samsung corby pro – GT B5310. Keypad is not working in my mobile all of a sudden. only touch screen is working.. how make the hard keys work????? pls help. I have corby s3653 and its Menu touch (bottom right) is not working. Can you please tell me other way of opening Menus OR Setting. I want to change the PC connection setting from Mass Storage to PC Suit. Sounds like a hardware problem mate, you’ll have to get the keypad checked.